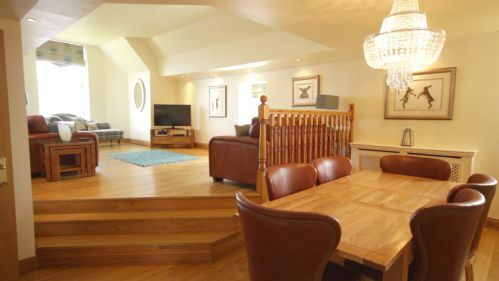 The Penthouse, Lomond Castle accommodates 6 people in luxury and style. 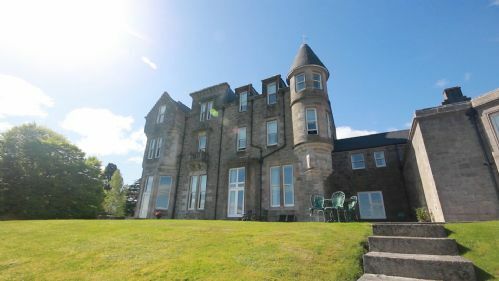 Luxurious and spacious 3 bedroom apartment (all en-suite) occupying the complete top floor of the original building in the exclusive ‘B’ listed Lomond Castle. Beautiful place to stay. Only downside was tried to contact someone for sky PIN number and just got referred to others who I could get hold of. That said I wouldn’t hesitate to stay again! We have a lovely time and our accommodation was excellent. Everything we needed and we would like to come again some time. We are returning guests as this is our favourite part of the world. Usually we stay in the Pier Cottage. But this year we had to try something different with the Penthouse. It‘s a very lovely and spacious place. It‘s also very nicely decorated and we felt instantly at home. The Penthouse is very well equiped. We only missed a few things, such as a toast stand or a smaller cafetiiere. Also a laundry basket would have been handy. We also missed some hooks in the hallway to hang our coats, especially when they were wet. But these are only tiny things. We really enjoyed our stay and can recommend it. The team, especially Liz and Wendy, is doing a brilliant job. They are the friendliest people in the world and are always happy to help. The best thing during this stay was an afternoon with some tea, a lovely view across the loch towards Ben Lomond and some gentle music from a piper who was playing at a wedding reception nearby. Lovely property for the time of year As we were indoors in the evenings, if we booked a property in this location in the summer would have preferred direct access to the shoreline! Our overall stay was very good. The views were to die for and almost perfect weather. I have to say disappointed with the condition of the bedroom carpets ( lots of stains) ,mattress too soft, for us anyway and pillows lumpy. The head housekeeper Wendy was very nice and helped us get heating up and running. This is a wonderful place to say. I almost don’t want to tell you in case it gets too busy and I can’t book in again. Expect, space and comfort and the most amazing views you can imagine. I spent hours on the little window seat soaking up the views. There are some great walks and the penthouse is well placed to tour the local area. Accommodation was very comfortable and spacious with excellent washroom facilities in all bedrooms. View over the Loch was outstanding whether the sun was shining or the mist was rolling. Location was great for days exploring the Loch or a day in the city, catching the train from Balloch to Glasgow. 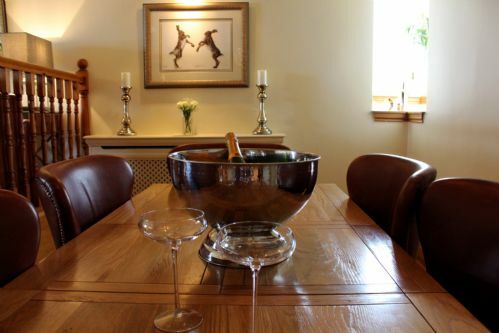 Would return to any one of the properties offered by Auchenheglish as the standard of accommodation and customer service was fantastic. Great apartment fully equipped for a fabulous stay.Super views from all windows.Were at wedding at Cruin so this was ideal 5 minutes walk away.Definitely would go back again for a relaxing break. 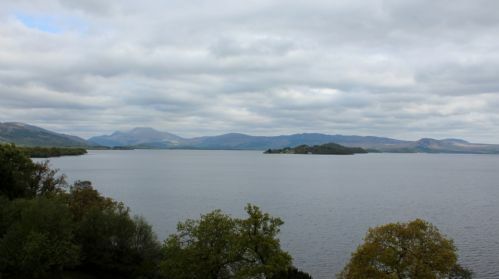 Fantastic apartment in Lomond Castle amazing views across Loch Lomond and lovely grounds. High standard of furnishings and decor, kitchen appliances were great and all cutlery and crockery provided. Loved the Turrets in master bedroom and dining room and we also had a window seat in main living room. Unfortunately, due to adverse weather conditions we were unable to make the journey. We were very disappointed and did ask under the circumstances if we could rebook it for another weekend! However, we were told no. This we felt a little disappointed about as it was through no fault of ours! We did let a friend stay for one night to try and make used of it! We are sorry that you could not make it here due to the adverse weather conditions. We completely understand your disappointment. Given the circumstances we explained that we would be more than happy to offer you any last minute availabilty in the Penthouse. As per our terms and conditions Section 3 we advise to arrange Travel Insurance and Section 11 mentions - We cannot accept responsibility or pay compensation for circumstances which amount to "Force majeure" which subsequently affects the provision of our service to you. Wonderful place to stay with friends or family. 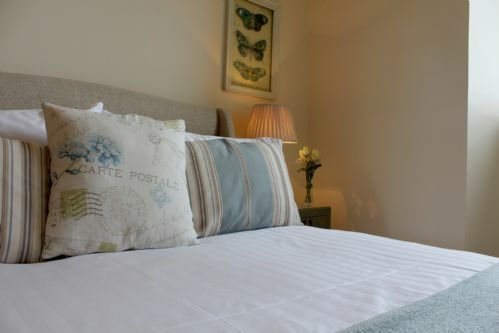 The Penthouse is a fabulous accommodation and has everything you need for the most comfortable stay. The views are outstanding and cannot wait to go back for another stay. You won't be disappointed with your holiday at the Penthouse. Our stay at The Penthouse was absolutely outstanding! This was our first time staying in an Auchenheglish property and we were not disappointed! The size of the accommodation, the standard and breathtaking views surpassed all our expectations. Will definitely be back. Booked the Penthouse as a surprise for my wife's 60th birthday. People in the office went the extra mile to help deceive her when we arrived, even hiding addition keys so that our daughters could arrive later with out her knowing. Worked a treat, thank you guys. The Penthouse had everything we could have wanted and the welcome pack was perfect. Views were fantastic especially from the turret in the master bedroom!! Would recommend staying here there is a wide variety of types of accommodation all to the highest standard. Look forward to returning. Really welcoming apartment and an outstanding location. Very spacious and high quality of furnishing and finishes. The apartment was very spacious, comfortable and furnished to the highest standards, with all mod-cons, and looked to have been very recently re-decorated/furnished. 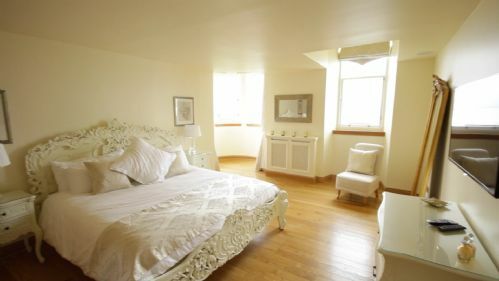 The master bedroom was akin to a bridal suite and the views over the Loch from the Penthouse were simply stunning. It provided an ideal bolt hole for our family while we attended a weekend wedding at the Cruin - we only wish we could have stayed longer! 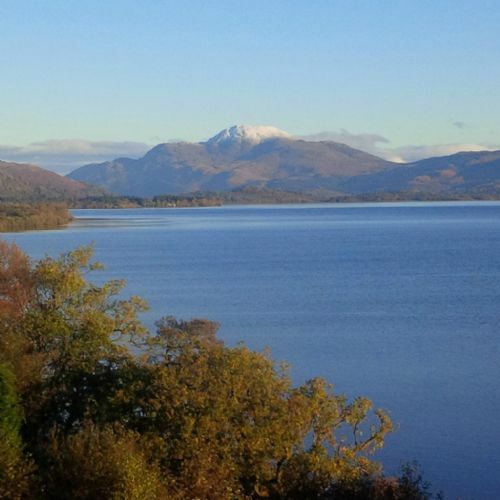 Fabulous apartment with great views of both Ben Lomond and Loch Lomond. We were at a family wedding in Luss and this was an excellent location to stay. The television and channels could do with being upgraded. The entrance and staircase up to the penthouse looked a bit tired and could do with some decoration. The instructions for the kitchen appliances were less than clear. Delighted to stay in Auchenheglish Lodges. The Penthouse is beautiful and after visiting different places around Loch Lomond , the view from the Penthouse was the most astounding. Three couples rented the Penthouse for 3 nights to attend a wedding weekend festivities at Cameron House. It was an easy walk (not in heels) to the other property. We took the train up to Ballach and taxi to rental office/property. We didn't realize there wasn't a lift, so the 3 flights of stairs with luggage were difficult. The views of the Loch were amazing and the suite was nicely decorated. The fridge was stocked with bread, butter, milk, orange juice and wine. Blow dryers were provided! My only real criticism was there was lack of towels; no kitchen towel (small roll of paper towels) 1 bath & hand towel per person, but only 1 washcloth for the entire group. There should really have been 6, 1 per person. Instructions on how to use the oven and cooktop would be helpful. It took us a while to figure it out. Otherwise, quite enjoyable stay. 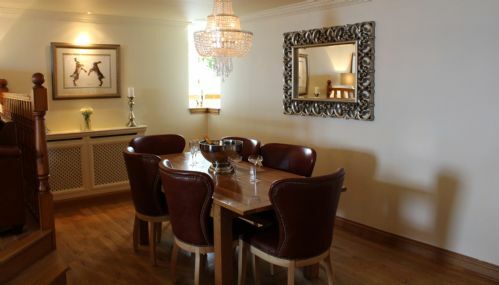 A beautiful place to stay on the Bonnie banks with stunning views and lovely furnishings that match the lovely Scottish surroundings, the pictures don't really do the place justice! Very comfortable beds with plenty of towels for us and the milk, bread and wine waiting in the fridge is a nice touch. Minor issue with lack of hot water on last day which was really unfortunate but I am however confident had we noticed the night before and informed property managers they would have tried to ensure the issue was fixed for us in the morning and were apologetic. Overall, we really did have a fabulous stay and hope to return to the property next summer! We were a party of three staying at the Penthouse so the place felt very spacious. Well decorated and furnished with gorgeous views from every window. Remember to take binoculars though as the pair provided did not work well. The kitchen was very well equipped and the welcome food pack was a really nice touch included in the rate. There was a knack to turning on the hob which was the only small frustration of the stay. Liz was wonderful with her timely responses to emails and in welcoming us on the day at the office. For us it was an easy walk to Lomond Shores and back. We took the car to Luss. Both worth a look with cafes, shops and attractions. Not the highlight of our trip for us, that accolade goes to the Isle of Skye, however a superb stay in a really lovely location in beautiful historic accommodation. We were a family of 6 staying for 3 nights earlier this month. The castle is beautiful and the Penthouse even more so. The view of Loch Lomond is stunning from every window. The kitchen is well equipped, beds are comfortable, and the sound system throughout the Penthouse is a nice bonus. Each room having its own ensuite is very nice. We went to Loch Lomond Shores which is not far away and rented bikes at the little beachfront area near the children's playground. We rode to Luss which is about 8 miles away, mostly on off-road tracks. Luss is well worth a visit and the trail is mostly flat with a few ups and downs but totally doable with our 10 year old. (Make sure you go through the golf course, much nicer trail off the main road.) You can also rent kayaks in Luss on another day and enjoy paddling around the Loch and all the little islands. The Penthouse was a highlight of our trip to Scotland. We booked The Penthouse as it was close to The Cruin for our daughter's wedding. The facilities are excellent, and tasteful decor. With splendid views of Loch Lomond our short stay was really enjoyable. Plenty of places of interest nearby. Thoroughly recommended. I cannot rate this property and location highly enough! Excellent customer service and wonderful welcome package really nice touch. The location is perfect for sightseeing or just relaxing and taking in the wonderful views. The Penthouse was beautiful, from the decor to the stunning views. We loved our three day stay and would book the Penthouse again if we are in the area. My daughter and her bridesmaids stayed in the Penthouse prior to her getting married and really loved the setting and the facilities. The location is amazing and the apartment was well equipped. The only drawback was just having one set of keys to the apartment, which is difficult when there are six people coming and going, especially when you need a fob to even access the grounds. 10 o'clock is also rather early to have to vacate the property on the day of departure. It was the first time being in Scotland and we could not ask for a better place to stay. We were please in all aspects. We would like to take the opportunity to thank Liz for her very fast responds on our inquiry and that she made an exception and allowed us to bring our doodle with us. Had a great weekend break.the apartment was all that we expected and more very clean and comfortable with the added bonus of spectacular views. We would have happily stayed a week here. There were six of us with varying interests and we found plenty to do in the surrounding area and fortunately we had the bonus of good weather. We had initial problems switching on the hob but after a quick phone call to Wendy she came and demonstrated it for us( we weren't holding the on button down for long enough).as a group we like to cook and found the facilities in the kitchen to be more than adequate but there were also restaurants etc.near by if you didn't want to cook. We all left much fitter having enjoyed many peaceful wailks in the surrounding area not to mention the 47 steps up to the Penthouse-but the views soon revived us! The Penthouse was a cut above, brilliant! For a family weekend we booked the Penthouse. Could not fault the accommodation & situation was excellent. What a view to wake up to in the morning!!!!! Booked again for September, Says it all!!!! wonderful place. 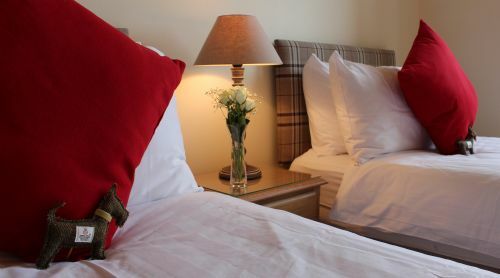 Everything you need for a long or short stay at Loch Lomond. We loved our stay at the Penthouse. It was certainly luxurious and the views in slightly snowy February were spectacular. The kitchen was superbly equipped. The bathrooms were amazing and the bedrooms extremely comfortable and spacious. We had our very well behaved 4 year old grandson as part of our party. I'm not sure whether some of his more boisterous contemporaries would have coped so well with the steps from the living area to the dining area. Curtain in big bedroom broken at end - hanging down. We stayed at the beautiful penthouse apartment for 3 nights during our wedding weekend. 5 star luxury. 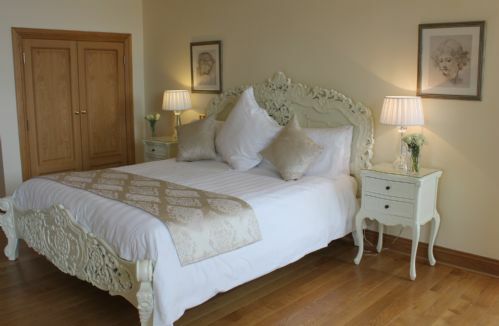 Beautifully presented rooms with fantastic views of Loch Lomond. Huge living area with large dining table off a spacious kitchen. Clean, well stocked and the welcome pack on arrival was a very nice touch. We stayed at the apartment for 2 nights for our dsughter's wedding and it was fantastic, beautiful accommodation with spectacular views. Would highly recommend!! Stayed here for a few nights with family. The property was very spacious and homely, spotlessly clean, and very good value for money considering it was school holidays. The Penthouse - didn't want to leave! We have just returned from a weekend spent at the Penthouse apartment in Lomand Castle. What a stunning place, we didn’t want to leave. The apartment itself is beautiful with three ensuite bedrooms, a large kitchen and a huge living-diner, all with stunning views of the Loch. The master bedroom is truly special, it’s a huge room with a large ensuite, but of course, it’s distinguishing feature is the turret again with wonderful lake views. All the beds were comfy with good quality bedding. In fact, the quality of the fixtures and furniture were very high throughout. The apartment is very well equipped, there is an iron and ironing board and each room has a hairdryer (this isn’t specified on the website so I had to email to check.) The welcome pack of milk, bread, orange juice, cereal, jam and bottle of wine were much appreciated. These lodges are situated about 4 miles outside Balloch, so a car or taxis are required. We were attending a wedding in The Cruain which is in the same grounds, so it was very convenient for that. Communication with Liz was excellent and very clear instructions were given on key collection etc. She was also kind enough to let us have a 12pm check out instead of 10am as our flight home wasn’t until late afternoon. We had a wonderful stay and my only regret was that we weren’t able to stay longer and explore the area, it’s a truly beautiful spot. The accommodation was fantastic. Liz, who booked it for us was excellent and I appreciated all her help. 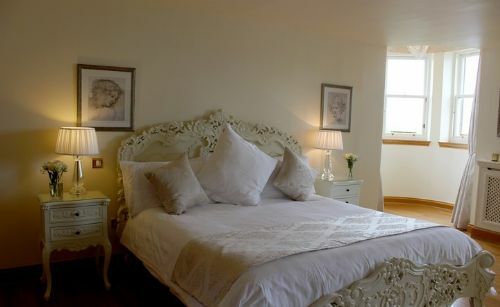 The bedrooms were superb with very comfortable beds & pillows. The owners had thought of everything and could not find anything that I would change. It was so quiet and relaxing. Although this was not an issue to us, please remember you have 46 steps to get up to the accommodation but worth it for the amazing apartment and views. We would definitely recommend this apartment. Sept 2016 was our second stay in this lovely castle, this time in the penthouse as there were 6 adults and a toddler. We had a wonderful few days and the Scottish weather didn't let us down with warm sunshine. The location is very central for some beautiful drives and plenty to do within easy reach. 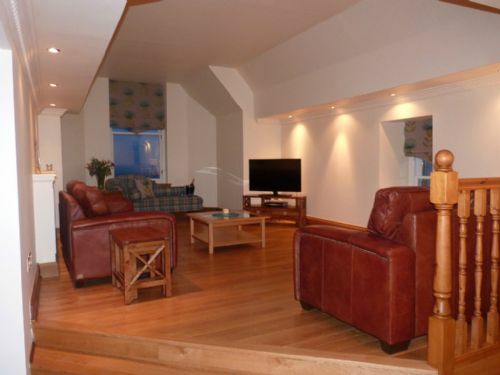 The apartment is tastefully furnished with a modern interior and beautiful views across the loch. The facilities are excellent with everything you need supplied, although it would be useful if the website gave more information on this such as a list of essentials, e.g. iron, hairdryer etc. Also instructions on how to use the hob for those of us not used to ultra modern equipment would be useful. I would thoroughly recommend the Penthouse as an excellent place to stay with a variety of places to eat within easy reach. There are a few flights of stairs to negotiate so may not be suitable for everyone but we had three generations in our party and had no problems. We look forward to our next visit. We had an enjoyable stay at Lommond Castle. I would recommend it to anyone. The locals where very welcoming and helpful. I would like to return to Loch Lommond and Lommond Castle for a future holiday. This was great value for money and a perfect place to stay on the shores of loch Lomond where the boys enjoyed lots of watersports and great views across the loch. We didn't stay much as we were out , I would def go back and actually spend more time, the place is really good, rabbits on the fields, as we were leaving we found out that there's 20 steps and theres a small enclosed beach area. Only downside is theres no BBQ, I'm not sure if it can be done on the grounds. Myself, my partner and 4 of our friends recently stayed at the Penthouse for 3 nights as a close friend was getting married at the near by Botourich Castle. The communication from the owners was great from the start and they were very helpful with providing information on how to get to the lodges and also instructions of how to access the keys etc. The Penthouse is situated on Loch Lomond behind electronically controlled gates which instantly made us feel safe as the only people who can access it are people who are actually staying at the property. 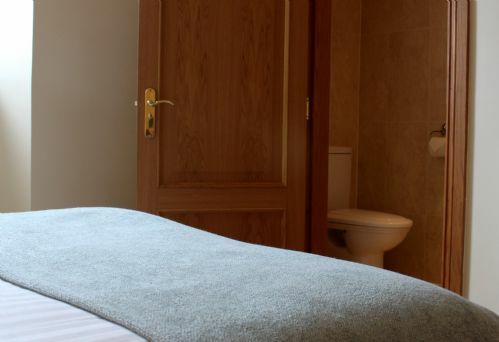 All 3 rooms have en suite bathrooms which made it very easy for everyone to get ready without getting in each others way. The rooms were spacious, especially the master bedroom which my partner and myself had the pleasure of staying in. The views over the Loch were beautiful and the location was great, on the Sunday afternoon we visited the Duck Bay Hotel which was a short 5 minute walk from the Penthouse which had great food and a lovely bar for a few drinks. Overall, we had a great stay at the Penthouse and would definitely like to stay again. Everything went like clockwork from check-in to departure. Beautiful stay,accomodation and fantastic views. Weather was a bonus as we had a large family get together on Sunday. Peace and quiet by the bonnie banks. Thanks to Liz and staff. It is not often that I am surprised these days, but on this occasion we attended a great wedding with family and friends that was made even better with the Penthouse to look forward to at the end of each day, an exceptional base to use for exploring the local area. My family and we would definitely use it again, thanks again. 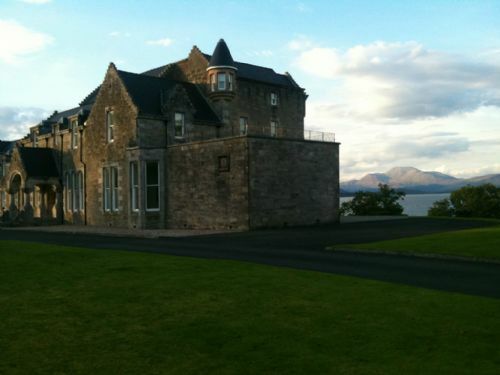 This appartment is one of the best I have ever stayed in with stunning views over the lake towards Ben Lomond. We thoroughly enjoyed our stay and would consider returning in the future. We thoroughly enjoyed our weekend stay at the Penthouse, it was more than fully equipped for all our needs. Stunning views in a morning even with low cloud/fog...! Our only one comment is the lack of information provided on the booking website with regards to what is provided i.e. dishwasher tablets, tea & coffee, hairdryers, bread and milk etc. These we all very much welcomed surprises and appreciated however it would have been good to know these basics were provided to prevent duplication. Stayed at the Penthouse from Friday 19th February to Monday 22nd February and it was a dream. On arrival we already had clear key collection instructions and entrance to the lodge and the apartment was completed with ease. The entrance hall is stunning, and the penthouse is right at the top of the building so there are alot of stairs, this was no issue for us, but something to bear in mind. The penthouse was simply stunning, every room was amazing, extremely clean and designed to a high standard, a truly Scottish theme throughout which made for beautiful pre-wedding photographs whilst getting ready for my big day. The master suite was the room I sued for my honeymoon (2 nights) and this was stunning, a larger room with a beautiful turret en suite bathroom and beautiful bedroom furniture. The welcome pack with basic groceries was a nice touch, and the facilities in terms of Wi-Fi, etc were also very good. The setting and views were amazing from all of the windows, and it was easy to have visitors coming and going to the lodge as needed on the day of the wedding for photos video etc, with a simple to use buzz in system. The only issue was the buzzer was not very loud and so you needed to be ready for visitors and know they were coming. Nothing else could be faulted, it was beautiful and I will definitely be booking again. The penthouse apartment was amazing. The views over Loch Lomond are amazing but the facilities within the apartment and the comnfort were also very high standard. What a wonderful few days we had staying at your Penthouse apartment at Loch Lomond. Everything was just perfect! In addition to the fabulous views, we especially liked the extra little touches such as the bottle of wine we found in the fridge upon arrival and the tea, coffee, milk & cereal that were provided. We will definitely be recommending to our friends! Fantastic property lovely views. We had a lovely holiday and enjoyed the property very much. My son (9) enjoyed the automatic gates on entry! We would definitely recommend this property. Great location and views over Loch Lomond. Excellent penthouse suite accommodation with large spacious rooms and 3 en suites. Friendly service and overall great value. Look forward to a return visit when it's less hectic and we can better appreciate the beautiful surroundings. Incredible beauty inside & outside! As a family of 5 we made this our main summer holiday staying for a week. All of us from aged 8-45 loved it. The accommodation is to the very highest standard. The tasteful hallway meets you when you arrive. 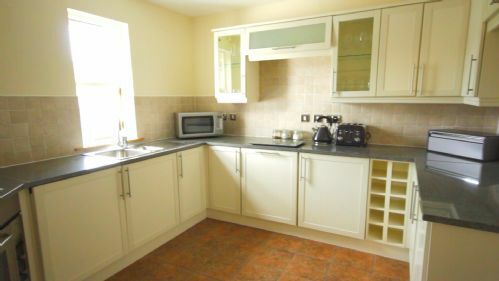 The kitchen is very practical and superbly equipped with top quality appliances. The living area is luxurious and our 2 boys loved the sky and bt sports channels. The 3 bed rooms are all en suite and to the highest specification. There is also an excellent level of general equipment e.g. ironing boards etc. The main wow factor awaits you when you wake up and look out the windows at the breathtaking views. Overall this was worth every penny and we have recommended it to family and friends. From first contact to leaving, my experiewnce was most satisfactory. While expensive, mainly due to £/€ exchange rate our stay was a pleasure. Some small quibble with loose bathroom fittings. The Penthouse apartment was a wonderful place to spend our honeymoon.Very private place, a well equipped apartment, standard of decor was marvellous.The scenery was second to none. We will be back for our anniversary! We had a fantastic stay. The penthouse is out of this world. Very special place with amazing reviews. Will defo be back! I loved the sound system and the master bedroom was beautiful. Really enjoyable stay. We attended a family wedding at The Cruin, so the location was ideal and worked out to be much better value for money than staying in one of the alternatives (no taxis required for a start). The Penthouse is just what you'd expect from the name - utter luxury. The apartment itself has been extremely well thought out & everything is provided to ensure a comfortable stay. We particularly liked that each bedroom was en-suite, so no short straws when we were all trying to get ready at once! And the view.....well, what can I say. It would certainly be on my list of Lottery win purchases (we can but dream). In the meantime, I wouldn't hesitate to recommend a stay here & we would absolutely love to find an excuse to come back. We have booked with these guys previously and again they have never let us down ! First time in Lomond Castle's penthouse apartment and we were blown away by its character, luxury, location and stunning scenery. Would definately return to this great place again. 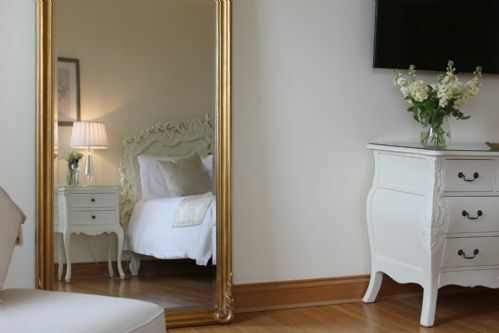 Fantastic 3 bed apartment, beautifully decorated and spotlessly clean. Great location can walk to the shops al Lomond Shores and into Balloch. Lovely places to eat roundabout. Really enjoyed our stay. What an amazing place the Penthouse is! Oh my, I can't stop thinking about it. The views from the building were amazing and I could not believe how lucky we were to be staying in such a beautiful place for such a reasonable price! 5 ladies celebrating my 60th birthday. Fabulous! Wonderful location, beautiful accommodation, everything we could have hoped for. We couldn't get the mood candles to work - but that was hardly a problem! The Penthouse at Lomond Castle was excellent. The views across the Loch are stunning. The facilities in the apartment where excellent. We had a wonderful time exploring the are and it was wonderful to return to the beautiful apartment for a relaxing evening. We had a lovely few days at The Penthouse. It was relaxing and comfy with stunning views over Loch Lomond. We were able to watch the Loch change hourly from the large sitting room window. The penthouse was exactly what we were looking for - and more! The location and views over Loch Lomond were absolutely stunning and the accommodation was more luxurious than we'd hoped for. It was absolutely perfect and we would definitely choose to stay there again and have already recommended to friends. Just wonderful! It would be difficult to imagine a more beautiful setting and location for a holiday home. The Penthouse is the perfect accommodation to visit the area. The whole atmosphere when you enter the front garden through the gates, and then go to the apartment is almost impossible to describe. The property is excellent in every respect, and all of the staff could not have been more courteous and helpful. We will definitely be going back again. This is my fourth time staying at Auchenheglish Luxury Lodges, all in different lodges and it has never disappointed. We stayed in the Penthouse on our most recent visit and it was simply amazing. The accomodation was stunning and the views spectacular. My mother, husband and children had a week we won't forget. The staff are also really helpful and friendly. We'll be back again next year! As always we were delighted with the warmth and friendliness of the staff and the standard of accommodation. It was a 65th birthday celebration and things could not have gone better. The comfort and facilities of the penthouse were second to none. We WILL be back. Thank you Graham and staff.